Oh my, it’s nearly That Time Of Year again: burning effigies, sparklers, terrified dogs, and jacket potatoes with charred skins and raw middles. Guy Fawkes’ Night is here again, so perhaps it’s a good idea to brush up on the ol’ fireworks skills in preparation for displays tonight, or more likely over the weekend, yes? Photographing fireworks is probably a bit easier than people think it might be. After you've found a good display, what you need to do is give some consideration to where you position yourself for great composition. And you'll probably want a long-ish exposure, too. Then you can opt for not-very-technical-but-needs-your-attention or a bit-more-fancy-but-hands-free means of capturing the multi-coloured explosions. Whichever means you choose, we advise shooting in Raw so that you have as much flexibility as possible when it comes to editing. Aside from your camera, the most important piece of kit you'll need to photograph fireworks is a tripod; night photography demands long exposures and long exposures mean camera-shake. Unless you use a tripod. With just your camera and a tripod, you can set your shutter speed and shoot away. But if you introduce some remote triggering into the operation, it leaves you able to enjoy the display as well as photograph it. Bonus! With your camera on a tripod and aimed toward the direction of the fireworks, you can set the shutter speed to anywhere between one and three seconds to capture the trails of the fireworks as they explode. You'll want to stick to as low an ISO as you can manage, so around 100 or 200, and set an aperture around ƒ/8.0. Fireworks are fairly bright. All set up? It's a case of releasing the shutter to photograph the bursts of colour. This is of course means that you'll have to share your attention between the camera and the display, as you'll be operating the shutter button. In the Triggertrap app, choose your exposure time, perhaps between one and three seconds, and set an interval between each shot of 200ms. Once you press start, you won't have to do any more other than watch the display, wave about your sparklers, and drink some mulled wine. 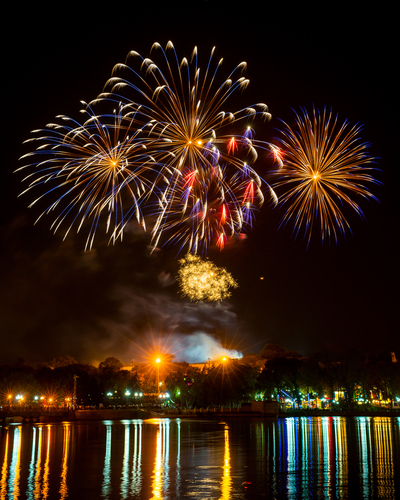 If you want to bring some more interest to your fireworks photos, try to incorporate something into the foreground of the scene that will bring some interest in silhouette shape. Trees are great, and people work well if they're holding still for the duration of the exposure. I don't mean to sound like a bit of an Eeyore, but please do be careful around fireworks. And enjoy it.